In 1970 the Federal Government passed the Occupational Safety and Health Act, which established the Occupational Safety and Health Administration (OSHA), which assures a safe and healthy workplace, from uniforms, to equipment, to procedures. 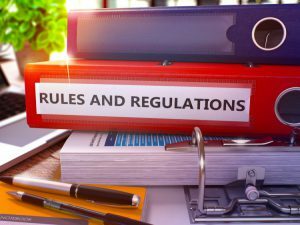 Each industry has their own set of uniform standards, laws, and regulations, and if any law is not met the fines can be hefty and negatively affect your company. OSHA is responsible for promoting and carrying out standards that are legally enforced by both state and federal agencies. Fines can begin at a maximum of $12,470, and will increase when not paid, or if the citation is repeated. Uniform Nations provide a guaranteed service to employers that their materials are up to code and meet all standards. These services will not only help avoid those costly fines, but will show your employees that their safety is a priority. Your employees are the ones working in the field, facing the job duties each and every day. They are the ones with the most inside knowledge to what precautions need to be taken, the best equipment needed and what can be improved. Giving them opportunities to express their concerns is crucial to improving your standards and keeping you OSHA compliant. Offer a suggestion box so they can confidently and anonymously express their concerns. Be a positive safety influence so they understand you are concerned for their safety. Surprise inspections are more common than anyone would expect and you do not ever want to be caught off guard, it could cost your company more than you can ever imagine. Taking the time to ensure that everyone is trained and informed on all laws and safety procedures can greatly benefit you overall. Keep training and education frequent to guarantee employees and management understand the standards most up to date standards. Benefit from the OSHA trainings offered, i.e. : informational services, speaking engagements, workshops, and consultation assistance. Develop a safety plan that everyone is informed of and familiar with. Practice them like you would fire drills so if a surprise inspection were to occur everyone will be calm and collected. Uniform standards are constantly changing so keeping updated on all the standards, laws, and regulations within your industry is crucial. Mobile apps are available to access daily inspection checklists. Other than going straight to the source of OSHA standards, the Federal Register, Safety Daily Advisor are amongst the best resources up to date state and federal standards. OSHA may seem like the “bad guy” to some, but when it comes down to it, they have you and your employees best interest. Complying with all the strict standards, laws, and regulations means that you are taking all your employees into your best interest, which can only benefit you and your company. Keep your company OSHA compliant! Get Quotes from Uniform Nations. At Uniform Nations, we partner with a nationwide network of reliable uniform service providers who make it a number-one priority to provide businesses with uniforms and PPE that comply with all regulations so they can ensure employers avoid steep fines and reputation damages. Call (866) 467-4178 today and find professional services near you that can help you stay OSHA compliant.